This post on natural supplements that keep your family healthy is sponsored by iHerb.com. The review reflects Eco Child’s Play’s honest, authentic opinion. As the seasons change, it’s inevitable my family or myself will catch some bug. Prevention is the best medicine. Hand washing is key to preventing germs invasion into our home from school. Drinking lots of water also helps. Another prevention tool that helps my family stay healthy is taking nutritional supplements. Keeping vitamins and minerals in balance maintains a strong immune system to fight off the inevitable germ and viral attacks. iHerb.com sent us seven natural supplements by Nature’s Way that aid in this fight. These products are designed for the whole family. Nature’s Way has a long reputation of trust. This affordable natural supplements company is partnered with the Non-GMO project. They are the first major natural supplements company to use TRU-ID validation, a DNA biotechnology that verifies the authenticity of herbs. 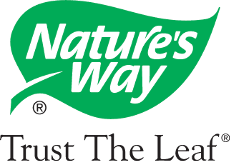 At Nature’s Way® we haven’t forgotten our past, nor have we lost track of why Tom started the company in the first place. A simple desire to do something more for people. To help them enhance their health. This has become the basis of everything we do. The very foundation of a growing legacy of trust. And an oath to our customers that we take incredibly seriously—Trust the Leaf®. It’s always best to try and get all of your nutrients from a healthy diet, but that is difficult with children and special diets. Natural supplements can fill in the gaps. Nature’s Way Alive! Calcium Bone Formula is a top seller! This plant-based calcium natural supplement is perfect for vegans and vegetarians. It is derived from Lithothamnion (a red algae seaweed sustainably harvested in Iceland), kale, spinach and collard greens. Most calcium supplements are made from animal bones or limestone. Cheap supplements made from calcium carbonate cause bloating and are not easily digested. Nature’s Way Alive! Calcium Bone Formula offers maximum absorption. It also contains Vitamin C, Vitamin D3, Vitamin K2, and magnesium to aid in utilization. I really like how this calcium supplement does not upset my stomach. I am very sensitive to other bone support natural supplements. Plant-based is definitely the best! Nature’s Way Alive! Gummies Multi-Vitamins for Children are thankfully free of most allergens like gluten, yeast, dairy, eggs, soy, and peanuts. These chewable gummies contain no artificial preservatives or flavorings. Sweetened with organic tapioca and cane sugar, these multi-vitamins are tasty and easy to get your child to take. The fruit and veggie blend is derived from oranges, blueberries, carrots, pomegranates, plums, strawberries, pears, apples, beets, raspberries, cherries, pineapples, pumpkins, cauliflower, grapes, açaí, asparagus, bananas, broccoli, brussels sprouts, cabbages, cranberries, cucumbers, peas, spinach, and tomatoes. Taking these natural supplements daily will help keep your children healthy and fill in any nutritional gaps from their diet. They come in three flavors: orange, cherry, and grape. Kids take three a day. Make it fun by seeking favorite flavors, taking one of each, or alternating days. Remember to keep these gummies out of reach. They do resemble candy, but they don’t contain iron. Iron overdose in candy-like vitamins is a common poisoning in the US. Nature’s Way gummies do have a safety lid, but best to keep hidden way from toddlers. Moms need to stay healthy and energized to take care of their families. Nature’s Way Alive! Women’s Energy Multivitamin Multimineral formula is perfect for busy women. They contain the same blend of fruits and veggies as the gummies featured above and are also allergen-free. The B vitamins are especially helpful in maintaining energy throughout the afternoon and evening. One reviewer on iHerb.com noticed their fingernails started growing like crazy on these natural supplements. The Alive! Women’s Energy formula does contain calcium carbonate rather than the plant-based calcium in Bone Formula. The quantity is small enough that it does not upset my belly or cause bloating. MCT stands for medium-chain triglycerides . They are a type of fatty acid that is derived from coconut oil. Consider MCT oil as a super fuel for your cells, because it boosts fat burning and increases mental clarity. Nature’s Way MCT Oil From Coconut comes from a pure source with no fillers. My naturopath has recommended I add MCT to my diet. In my experience, it is best taken with food. For example, I pour a tablespoon on a salad or add to smoothie. I get an upset stomach if I take it first thing in the morning, but many people don’t have this side effect. This MCT oil is also non-GMO certified like all Nature’s Way products. MCT oil is an ingredient in popular bulletproof coffee. Keeping Dad healthy is an integral part of family health. Nature’s Way, Alive! Max3 Daily Men’s Max Potency uses a mushroom mycelium defense in addition to daily greens and a cardio blend. This natural supplement is specially designed to balance mens’ body systems including bones, cells, digestion, eyes, heart, immunity, metabolism, and muscles. Of course, these vitamins are gluten-free, as well as free of other common allergens. It is recommended Dad take three tablets a day with food. I find it easiest for the whole family to remember to take their natural supplements at the same time. Since dinner is the meal we are most likely to be together, it’s a good time to set a routine for supplementation. Echinacea and goldenseal are the powerhouse herbs for immune support. Nature’s Way Echinacea Goldenseal is a family-friendly, glycerin formula. Glycerin tinctures are much easier for children to take for their sweet taste. Alcohol blends are harsh. Probiotics are an essential part of digestive and immune health. Nature’s Way Primadophilus Reuteri Superior Probiotic is a multi-strain formula that contains both Lactobacillus and Bifidobacterium, both of which has been tied to mental health. This product also comes with “True Potency™ – a guaranteed potency of at least 3 billion CFU through to its expiration date”. These probiotics come as a powder, which makes they are easy to hide in a smoothie or on top of yogurt. Kids sometimes are tricky to give supplements to, and powders like this make it easier to sneak into food they already love. Probiotics are essential to our gut health, immune system, and mental health. Antibiotics kill off both good and bad bacteria. It is essential to replace and rebuild our gut flora to stay healthy. Probiotics even fight infection! I stay healthy by taking probiotics every day! New customers get $5 off their first order from iHerb.com! Just order $20 or more of Nature’s Way products and enjoy the discount! (Click the link above or click here). iHerb carries over 400 Nature’s Way products making shopping online super easy. Their immense inventory and search function makes it simple to find what you need. The company has been in business for over two decades and is a Google Trusted Store. Additionally, the customer service team speaks 10 different languages. Checkout is quick and efficient; shipping is fast and affordable! They ship to over 160 countries! You are sure to find many natural supplements to support your family’s health over the coming months. All of the products featured above are important to my family’s health and well-being. In an ideal world, our diet would provide all the nutrients we need. Given we have a Celiac, vegan, vegetarian, and omnivore in the family, meal time is already challenging enough. Coupled with picky eaters, natural supplementation fills in any gaps our diet may miss.